Katara Hospitality, a leading global hotel owner, developer and operator, based in Qatar, has awarded Phase 2 construction works of Katara Towers, Lusail City’s future hospitality landmark, to HBK Contracting. The announcement came during a signing ceremony between Katara Hospitality and HBK Contracting, a leading construction firm operating in Qatar, assigned to construct Katara Towers 36-storey cross-swords design, MEP (back of the house), and First Fix (front of the house). The signing ceremony took place at The Ritz-Carlton, Doha and was attended by Sheikh Nawaf bin Jassim bin Jabor Al-Thani, chairman of Katara Hospitality and Sheikh Ali bin Hamad K. Al-Thani, president of HBK Contracting. 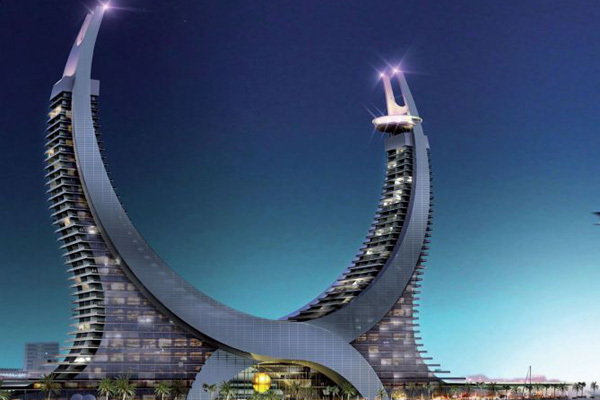 Symbolically intertwined with Qatar’s heritage, the iconic towers' design is an architectural translation of Qatar’s national seal, representing the traditional scimitar swords. The contract award will allow HBK Contracting to begin work on the swooping structure of the towers which will dominate the skyline of the Lusail Marina District. HBK Contracting will remain as the main contractor for the forthcoming works of Katara Towers until project completion over the next 32 months. When complete, Katara Towers will house a luxurious five-star hotel, the first six-star hotel in Qatar and branded residences to become home to potential residents. The complex will make available a total of 505 rooms and 49 apartments. The project has been enhanced with a man-made satellite beach front island that will be home to a mix of entertainment and recreations facilities and a potent restaurant mix of celebrity chef, global brands and homegrown brands restaurants.